Summer brings with it sunny days, long weekends and holidays! I thought I would use this month’s blog to write about the different things owners need to consider when travelling with your pet. If you are anything like my family, we work hard right up until the day we are going away and then scramble to get prepared. Making a list is a good idea for everybody, but especially when pets are involved as there are so many things to consider. If you are driving, remember that it is safest to keep cats in carriers and dogs out of the drivers’ area. There are several types of seat belt harnesses for dogs that can help to keep your dog safe while driving. Pets, just like children, should be protected from airbags as they have the potential to do more harm than good when the “passenger” is under a certain size. If your pet gets stressed or car sick, your veterinarian can help you by prescribing a medication suitable for animals; do not give your pet medications designed for humans as some of these can be very dangerous. 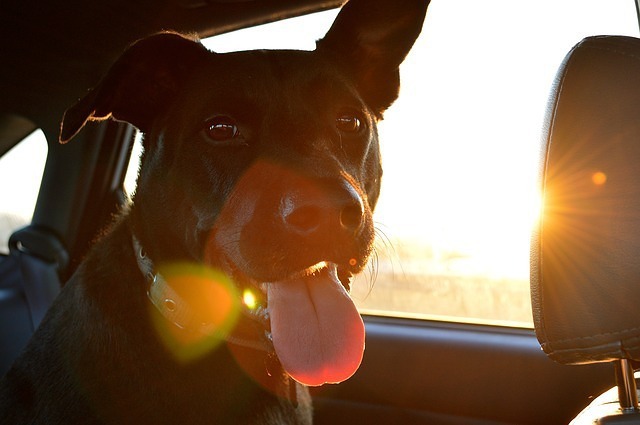 Of course, it goes without saying that hot days lead to very hot cars and so do not, under any circumstances, leave your pet unattended in the car for even a brief period of time. If you are travelling to the cottage or to a certain region for any length of time, look into whether there is a local veterinary clinic and/or emergency clinic and keep the numbers on hand. Of course, always have your own veterinary clinic phone number programmed into your phone so that, if the need does arise, you are not scrambling to get this information. Travelling with your pet outside of Canada will require some additional effort in advance. Pets must be up-to-date with their vaccines and you will require proof if you plan on taking your pet across the border. If you are travelling internationally you will need to look into what the specific regulations are for the country you are travelling to. Each country will have different prerequisites and some of these will require you to plan weeks or even months in advance. To find out what steps you will need to take, visit the CFIA (Canadian Food Inspection Agency) website and/or the embassy website for the country in question. Being in a new environment can be exciting for us as humans, but for pets it can sometimes be a little confusing or even scary. While some pets adjust easily to new surroundings, others may require some time to adjust. During this time, they may spook more easily and it may be more difficult to predict their behaviours. Protect them from getting lost or injured during this period of adjustment by being more aware of their environment and how they are behaving. Always ensure your pets are wearing collars with tags identifying them and how to best reach you. Remember that a home phone number when you are away from home will not allow anybody to contact you easily so make adjustments accordingly. Nothing is more fool-proof than a microchip as it cannot get lost or fall off. Microchipping your pet will allow for peace of mind if they were ever to go missing or, worst case scenario, be stolen.